How A Tilt Toward Safety Stopped A Scientist's Virus Research : Shots - Health News The U.S. government has stopped some experiments with dangerous viruses, saying the risks need to be reconsidered. Key work in one scientist's lab has been halted. 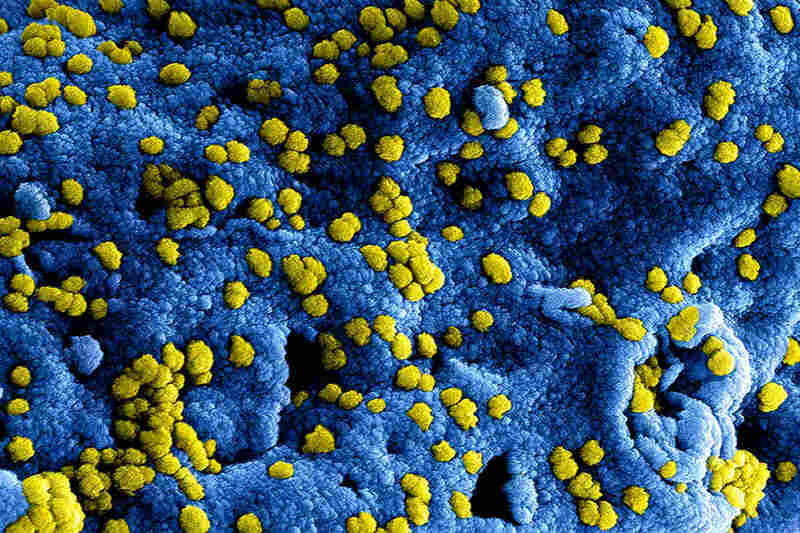 Middle Eastern Respiratory Syndrome virus particles cling to the surface of an infected cell. As cases of a worrisome respiratory virus continue to pop up in the Middle East, scientists who study it in the U.S. are struggling to understand how they'll be affected by a government moratorium on certain kinds of experiments. One of those researchers is Ralph Baric, a virologist at the University of North Carolina School of Medicine in Chapel Hill. "Any virus that has pandemic potential, and that's any respiratory virus that emerges from animals, is a major public health concern," Baric says. And Middle East respiratory syndrome, or MERS, fits that description perfectly. Camels seem to carry it, and it has sickened more than 900 people so far. Over a third died. If this virus mutates so that it spreads easily through the air, millions could die. "It would go around the globe quickly, and this would result in high morbidity and mortality, disruption of the economy, and, in some cases, the collapse of governments," says Baric. That's why researchers want to learn as much as they can about MERS. It's a type of virus called a coronavirus, which is the special focus of Baric's lab. Usually coronaviruses only give people a case of the common cold. But MERS is the second deadly coronavirus that has jumped from animals to humans. The first was SARS, about a decade ago. "Ralph is probably the foremost coronavirus biologist in the United States and one of the best in the world," says Matthew Frieman, a virologist at the University of Maryland School of Medicine who used to work in Baric's lab. He says Baric's group has produced essential research tools — animal models, antibodies and mutant strains — that are used in coronavirus labs around the country. Almost anyone working on coronaviruses would admit that Baric is "the big cheese," Frieman says. And Baric gets a lot of funding from the government. So he really felt the effects in October, when the White House did something unusual. Officials said they were halting certain government-funded experiments on three viruses — influenza, SARS and MERS. The Obama administration was concerned about any research that could make the viruses more dangerous, so they wanted to stop and review studies to see if they could make these germs capable of causing more disease or spreading easily through the air. Officials with the National Institutes of Health say that about 18 grants, contracts and planned research projects fall under the new ban. They say waivers can be obtained for research that's critical for public health, though it's not clear exactly how long that will take. Virologist Ralph Baric in one of his labs at University of North Carolina, Chapel Hill. At first Baric was blissfully unaware that anything had happened. Word of the moratorium came out on a Friday afternoon when Baric was out of the office. He has four kids, and a daughter was getting married. "I had a fantastic weekend. It was a beautiful wedding. It was one of the best times of my life. She was so happy," says Baric. He recalls that when he came back to work that Monday, he opened his email and was stunned to learn about the moratorium. He thought of all his lab's research projects. "It took me 10 seconds to realize that most of them were going to be affected," he says. The government's move came in the wake of some high-profile lab mishaps at the Centers for Disease Control and Prevention, plus some extremely controversial flu experiments. Those flu studies made a deadly bird flu virus called H5N1 more contagious between ferrets, the lab stand-in for people. The goal of that work was to see whether this bird flu virus might mutate in the wild and start a pandemic in people. Critics were aghast. What if this lab-made superflu escaped? "I don't think it's wise or appropriate for us to create large risks that don't already exist," says David Relman, a microbiologist at Stanford University. He thinks the government was right to include SARS and MERS in this moratorium, because they are so close to being pandemic viruses. "I'm quite delighted that great scientists like Ralph Baric are working on SARS and doing the work they are doing," says Relman. "But there still are specific experiments that I think should cause everyone pause and potentially cause concern if conducted." For SARS and MERS, he says, "the one thing that I would feel most concerned about doing is to give them that one missing trait, their means of transmitting easily between humans." Baric says that kind of experiment is not happening in his lab. He's not trying to change the way SARS or MERS gets transmitted. In fact, he doesn't know of any lab trying to do that. Still, his group has recently been tweaking the genes of the MERS virus. So is he making it more dangerous? "If you're a mouse, the answer is probably yes, or at least I was trying to," says Baric. Scientists study viruses in mice, so they can test vaccines and drugs. MERS doesn't make mice ill. Baric wants to alter the MERS virus so that it can make mice as sick as it makes people. The trouble is, the government ban applies to all experiments that might make these viruses more dangerous in any mammal. "These three agents that are subject to the pause share the characteristics of not only being human health threats — causing in some instances significant morbidity and mortality, as you know — but furthermore having the potential to be the agents of a pandemic because they are transmitted easily by respiratory droplets. So experiments that would make them even more pathogenic in mammals (and hence potentially in people) were concerning enough to warrant placing those experiments under the pause until their risks and benefits could be better characterized." But Baric says, when it comes to SARS and MERS, there are key differences between people and mice. "No. 1, mice don't sneeze," says Baric, so they don't transmit these diseases through the air. And he says the process of adapting these viruses to mice actually makes the germs less able to infect human cells. Still, he's doing what the government wants. "The NIH has asked me to stop those experiments," says Baric, "and so we have stopped those experiments." He's hoping federal officials will soon grant him waivers that will let that work continue. He's been told that other studies can go on for now but will need to be reviewed later. Asked if his lab is creating any new forms of these viruses that would be more dangerous for people, Baric replied: "Absolutely not. And we do more genetics in coronaviruses than probably anyone else in the world." He was surprised that SARS and MERS were included in the moratorium. But he understands that controversial flu experiments did raise real concerns for scientists and the public. "And as stewards of that public trust, I think we have to have open dialogue about that, I think we have to have transparency," says Baric. He says he may not ultimately agree with whatever guidelines are put in place, but "if that's what it takes to continue the research, then that's what we'll do. Ultimately we are responsive to the public." It's clear that Baric really, really likes viruses. They've fascinated him ever since a swimming scholarship took him to college and he got a job in a virology lab as an undergraduate. His life's work began there at a sink, where he earned a couple of bucks an hour to clean the flasks and glassware. "I started as a dishwasher," he recalls. "I'm pretty good at it. I can still do that." He later learned that he was also good at working with viruses in the high-containment biology lab, a specialized skill that not everyone can master. One of his co-workers, Lisa Gralinski, recalls that she always knew when Ralph was in that lab, because she'd hear disco. "You can see on the sign-in sheet who's in there, but sometimes you can tell in advance based on the music," she says. "If it was the Bee Gees, I knew it was Ralph." Baric says viruses can be dangerous, but they're also elegant. They're a form of life that's so simple, he says, you actually have a shot at understanding how it all works. 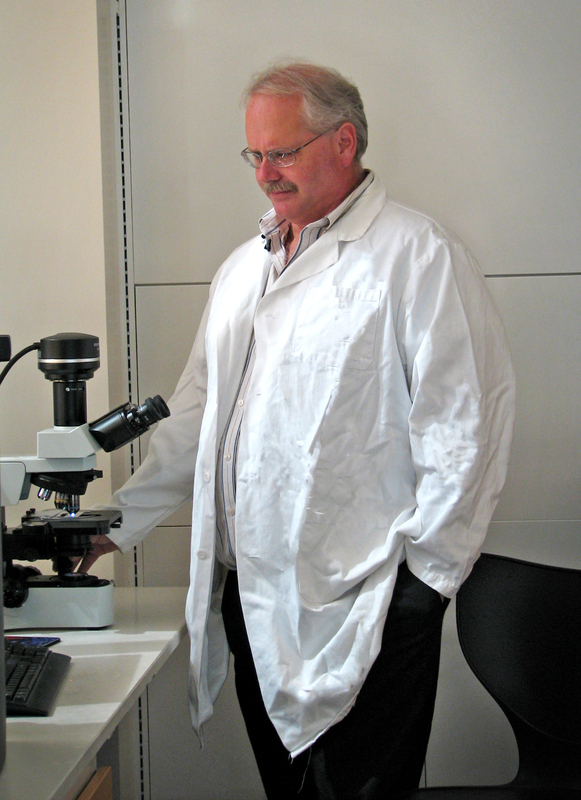 "And so viruses provide beautiful, intricate probes that allow you to study that," he says. "There's a certain beauty in them."